Saturday, September 20th is the Ocean Conservancy’s 29th International Coastal Cleanup Day. 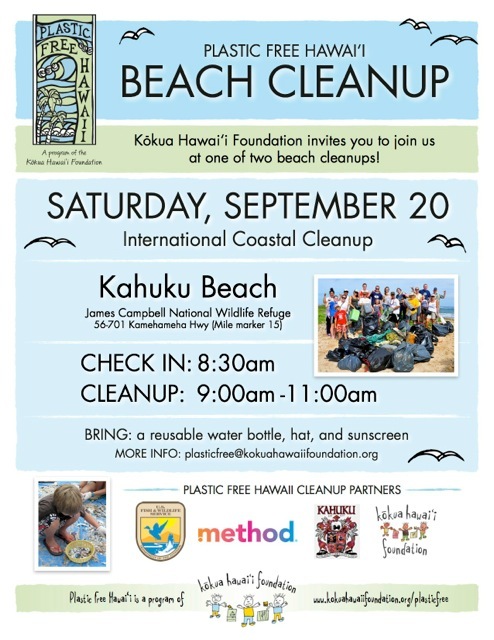 Join Kōkua Hawaiʻi Foundation’s Plastic Free Hawaiʻi at James Campbell Wildlife Refuge at Kahuku. Check-in starting at 8:30am with cleanup from 9:00am - 11:00am. We will be collecting marine debris for Method's Ocean Plastic 2-in-1 dish + hand soap, the world’s first bottles made with a blend of recovered ocean plastic and post-consumer recycled plastic. Directions to James Campbell Wildlife Refuge at Kahuku: From Turtle Bay side turn left off Kamehameha Highway at mile marker #15 on the beach side, it is the only paved road. From Kahuku towards Turtle Bay, pass the Kahuku Hospital, turn right after the 2nd bridge just before Kahuku Farms. Volunteers should bring sun protection, refillable water bottles, and gloves. Buckets, colanders, and reusable rubbish bags are helpful. Click here for more details. Partners include U.S. Fish & Wildlife Service, Method, and Kahuku High & Intermediate School Green Club. Contact [email protected] with questions.